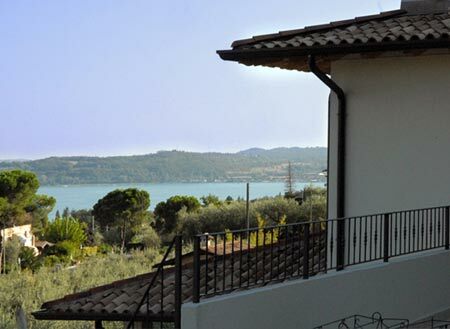 - Farm Holiday "Nonna Bettina"
Nonna Bettina is the ideal Farm Holiday for you: it is set in a well-positioned olive grove with a spectacular views of the Garda Lake, particularly of the Sirmione Peninsula and of the Bay of Desenzano. Surrounded by wide grounds with gardens, porticos, sun terraces and areas for relaxation, it is the ideal place for everyone: couples, small groups and families. Nonna Bettina, as you can see from the satellite map linked in the page named "Our Location" page, is the perfect base to explore a unique landscape. A network of public footpaths and scenic walks, which can be found behind the house, connecting the little towns of Moniga, Padenghe and Soiano, will give you the opportunity to enjoy rare species of flora and fauna. The harbor, the lakeside and the beach are within easy walking distance of Nonna Bettina, following a path bordered by a stream. Rooms at Nonna Bettina are spacious and comfortable and each room features a large en-suite bathroom. Babies’ cots or children’s beds are also available. Guests have full use of the inside and outside kitchens which is a further opportunity to save money. As is the use of the garage for cars where there is also space for boats.